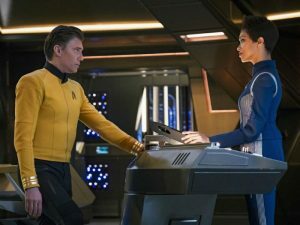 Captain Christopher Pike takes temporary command of the U.S.S. Discovery on a mission to investigate a series of mysterious signals, leading the ship into a dangerous asteroid field and an unexpected rescue mission. Meanwhile Michael struggles over her strained history with her foster brother, Spock. Last edited by GateWorld; January 24th, 2019 at 10:23 AM. Pike: "I was expecting a red thing, where's my red thing?!" "That's the power of math, people!" Hey the doors to Spock's quarters say 3F. I bet that lines up with the little sign on the doors you'd sometimes see in TOS! Did anybody catch TOS/Spock references when Burnham was in his quarters? I'm sure there were some, but I missed them/didn't take note. In all, I thought this was an excellent season premiere. I can't wait for the next episode! You know something that I found really intriguing is how Burnham basically implied that if the federation fell the ships on their 5 year missions like Enterprise would be how the federation would have continued. That the best episode of STD so, awesome, they sorted out the graphics so everything isn't a blurred mess like season 1, the story was cool, Captain pike was instantly likable, even if his fake persona of being Mr Nice guy grew a few cracks in it through the episode. Really the only thing I didn't like was Spock storyline and his step sister, really could have done without all of that rubbish. An knowing the klingons are going to show up, put a massive dampeners on future episodes. I reckon this mysterious red angel is an Iconian. It look similar to the design of the aliens in Star trek online. An even STNG computers went haywire around Iconian technology and its transmissions. Tilly is still the best character on the show. Hope we see more of Jet Reno and her kids, just not in medical bay, man the medics on std got a lot of work patching up those crewman. An how did she survive for 10 months on that asteroid? and where is the rest of her crew? This show looks so amazing. The sets, the actors, the customes, the story... This is how a scifi tv show should look like in 2019. Bravo. 1. When Discovery first encounters the Enterprise, they note that sensors detect 203 lifesigns, the ship's full complement. This matches Captain Pike's line in the TOS pilot "The Cage," where he states that he is responsible for 203 lives. 2. Sarek tells Burnham that he hasn't seen Spock in "years." This tracks with Sarek's appearance in the TOS episode "Journey to Babel," where we learn that Sarek and Spock haven't spoken in years, and Sarek was not expecting to see him ever again. 3. Discovery's transporter officer is wearing a device over his eyes that bears a resemblance to a VISOR. While not strictly a reference, it does appear to at least be a nod to TNG. 4. When Pike is taking command of Discovery, he says "back in Mojave, I learned the best way to get in a cold stream was to jump right in." In the TOS pilot "The Cage," we learned that Pike was born in Mojave. 5. Commander Nhan (the female officer who comes to Discovery with Pike) is wearing headgear that identifies her as a Barzan, a species first depicted in the TNG episode "The Price." 6. When Pike's acting science officer, Connolly, acts jealous about Discovery, Pike points out that 'at least we get the new uniforms,' indicating that the TOS uniforms are out there, but aren't yet fully deployed across Starfleet. 7. (Not-quite canon reference): The space suits that they wear in the asteroid field have division colours, which matches up with what was depicted in the Kelvin timeline, rather than the Prime timeline. “The vessel’s entire complement is alive,” Burnham says as the Discovery struggles to make contact with the Enterprise. In the original Star Trek pilot “The Cage,” Captain Christopher Pike states that he is responsible for the safety of 203 lives. “Back in Mojave, I learned the best way to get in a cold stream was to jump right in,” Pike says as he steps of the captain’s chair. It is established in “The Cage” that Pike was born there, though canon is still unclear where on Earth the city of Mojave is located. Captain Pike beams aboard with two crew members – his temporary science officer, Lt. Connelly, and a female officer in a red uniform identified as Commander Nhan. “I see where the Federation puts its pennies,” she says admiringly of Discovery, as Pike heads to the bridge. The Enterprise team of Pike, Connelly, and Nhan land on the asteroid in landing pods wearing EV suits coordinated with the colors of their divisions, while Burnham wears a neutral silver design. This mirrors the Kelvin Timeline orbital jumpsuits that Kirk, Sulu, and Olson wore on their way to land on Nero’s mining platform in Star Trek 2009. - the Star Cross, first referenced in TNG "The Measure of a Man"
- the Legion of Honor, first referenced in TNG "The Measure of a Man"
- the Carrington Award, first referenced in DS9 "Prophet Motive"
Pike's service record also indicates he had been on medical leave due to laceration, which may be a reference to injuries he took just prior to "The Cage" (why he was in such a funk when that episode started). 9. The Hiawatha isn't the first time we've heard of dedicated Starfleet medical ships. The most obvious is the USS Pasteur in the possible future seen in the TNG finale "All Good Things..." Also, we learn that the Hiawatha was en route to Starbase 36, which was first referenced in the TNG episode "The Mind's Eye." 10. Right before Connolly dies, he says his Academy roommate was a Caitian. Caitians would be the catlike species who debuted in The Animated Series (Lt M'Ress) and have only been seen in live-action briefly in The Voyage Home. Tig Notaro's character also mentions Tellarites (who have been seen many times, particularly in TOS) and Bolians (who made lots of appearances in TNG and VOY). Also, that lizard dude in the turbolift? He was a Saurian. Saurians are often referenced in relation to Saurian brandy in TOS, and one made a brief appearance in The Motion Picture. 11. Transport pattern enhancers, of course, turned up lots of times in TNG. 12. The "flux coupler" that Tilly asks about shortly before capturing the asteroid (which Stamets, arriving in the shuttle bay, hands to Airiam), is not a new technobabble tool. It previously appeared in DS9's "Empok Nor" and ENT's "E²." 13. Spock's quarters are labeled 3F, the same number they were given in TOS. Shown inside his quarters are a 3D chess set (we often saw Kirk and Spock playing 3D chess in TOS), as well as that harp he liked playing in TOS. 14. Tig Notaro's character disgustedly mentions blood wine when Pike and Burnham tell her that the war is over. Blood wine is, of course, well-known from TNG and DS9. One thing I just realised and am quite fond of. The sheer number of commanders aboard Disco now. Like both Saru and Burnham are full Commanders. Stamets was promoted to Lt. Commander. I think we already had Lt. Commander Airiam. And the new engineer is also a commander but not sure what grade yet. It's been a long time since we had that many high ranking officers in one show. TNG might be the only other one. Yeah you're right...I hadn't even noticed. One thing I do hope they sort out is the internal structure of the disco when it comes to their CG design team. The landing pods are... technically just possible to fit under the shuttlebay. But the launch tubes were far too long given that the pods only had to go from the back of the shuttlebay to the front. Also the internal shot of the turbolift when the Enterprise party first got there just looked ridiculous with all the massive open space and with apparent room for work bees to fly about and fix things. It just didn't make sense. This episode is now available for free on YouTube.